“Changing over from active to passive LED cooling does not only brings an immediate cost reduction on the cooler itself, it also eliminates the need of a more complex and expensive LED driver, brings the noise to zero and reduces the risks of breakage an active element always poses. The only reason why many designers still today were using the same active cooler as a few years ago was the lack of good passive alternatives which also mechanically fit in their current designs” according Koen Vangorp, General Manager at MechaTronix. For that reason MechaTronix has developed the ModuLED Micro. This passive star shaped LED cooler is specifically developed in a diameter of 86 millimeter. 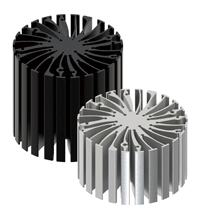 Most active coolers in the market are designed in either a diameter of 86mm or 87mm. The MechaTronix designers were aware that mechanical adaptations in an existing luminaire are not always easy to do, and have incorporated in that way a mechanical design which allows 1-to-1 replacements. Although the mechanical compatibility the design has a complete different behavior with regards to thermal management. The base of an active cooler only gives a good performance under forced air flow conditions. In a free air convection environment, these mechanical bases are not optimized for ideal convection and radiation cooling. The ModuLED Micro is developed in this way that there is an ideal balance between conduction, convection and radiation, what leads to an improvement of over 20% in cooling capacity. With 3 standard heights of 30mm, 50mm and 80mm the ModuLED Micro performs respectively a thermal resistance of 1.8°C/W, 1.5°C/W and 1.2°C/W. As an example we take here the latest generation LED module of Philips Lighting, the Fortimo SLM G4 which just launched recently. The Fortimo LED SLM 4500 is a 4500 lumen package with a variety of CCT and CRI values available. In an ambient temperature of 35°C this module needs a LED cooling capacity of 1.28°C/W to maintain the junction and case temperature at the ideal design reference. So with the ModuLED Micro 8680 in a height of 80mm and a cooling capacity of 1.2°C/W this gives an ideal combination. The ModuLED Micro is foreseen from a variety of standard mounting holes making that almost all round shaped LED modules and various COB formats can be directly fitted on the LED cooler without the need of extra drilling and tapping. Samples and design assistance are available through the worldwide distributor channels of MechaTronix.